For years, Wix received a lot of grief from webmasters who found it difficult to manage their marketing and track tags on their website. It soon became apparent how difficult this could be as many were unable to find a way to add Google Tag Manager to their Wix websites. Setting aside all debates or arguments over whether Wix is a great platform for website design. What I will say is that Wix, like any other content management system, has its advantages and disadvantages. While Wix is an easy-to-use and flexible platform for creating beautiful websites, it does have limitations when it comes to SEO. Although Wix supported the use of Custom HTML widgets, users quickly realised that these widgets did not support Google Tag Manager. When Google released their tag management tool back in 2012, many loyal Wix developers wondered when Wix would finally cave and release a feature to support the implementation of Google Tag Manager. Online threads from forums such as Reddit and StackOverflow battled tirelessly to find a solution to this issue. However, time and time again, these efforts fell short of the hurdle. Now after many years of waiting, Wix finally released a built-in feature on their platform to support Google Tag Manager. 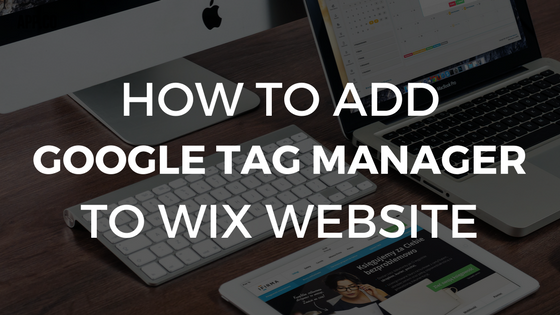 Today, I will provide you with a simple and easy step-by-step guide to how you can add Google Tag Manager to your Wix website. Google Tag Manager, often referred to as GTM, is a tag management system which was developed by Google in October 2012. 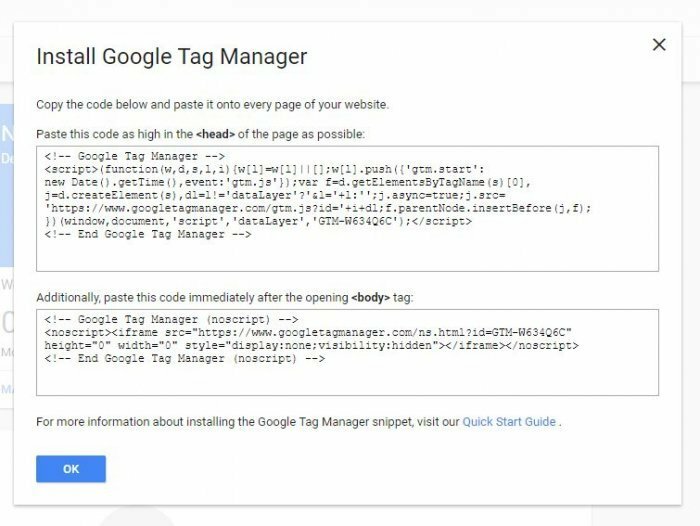 Google’s Tag Manager tool was designed to allow webmasters to quickly and easily update tags and code snippets on their website. Long before Google’s release of Google Tag Manager, webmasters had to manually insert code onto their websites; often spending hours tediously inserting code into elements such as links and buttons to track user behaviour. Now with the help of Google Tag Manager, webmasters can add and update their AdWords, Google Analytics and a wide range of third-party and custom tags effortlessly. Using a tag management system such as Google Tag Manager, you can replace any and all hard-coded tags which may be present on your website. 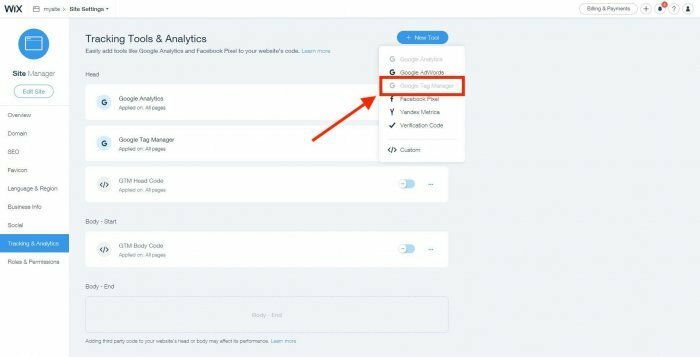 However, you’ll find that the more common use for Google Tag Manager is creating tags for marketing, analytics and testing purposes. Replacing static tags on your website with Google Tag Manager’s dynamic tags will make it much easier to implement and update changes in future. Google Tag Manager uses something called a data layer which captures key data points. Think of the data layer as a spreadsheet of information that you want to obtain about specific pages, events or activities that your users are viewing and performing. 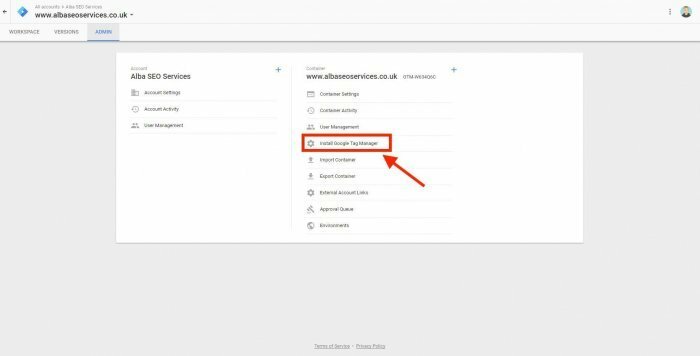 Information collected in this data layer is sent back to connected applications such as Google Analytics through Google Tag Manager. Using a container tag placed onto your website, you can replace all other forms of manually-coded tags. You no longer need to maintain code snippets for any tags in your source files. Instead, you simply specify the tags you want to fire and when you want them to fire from within your Google Tag Manager account. 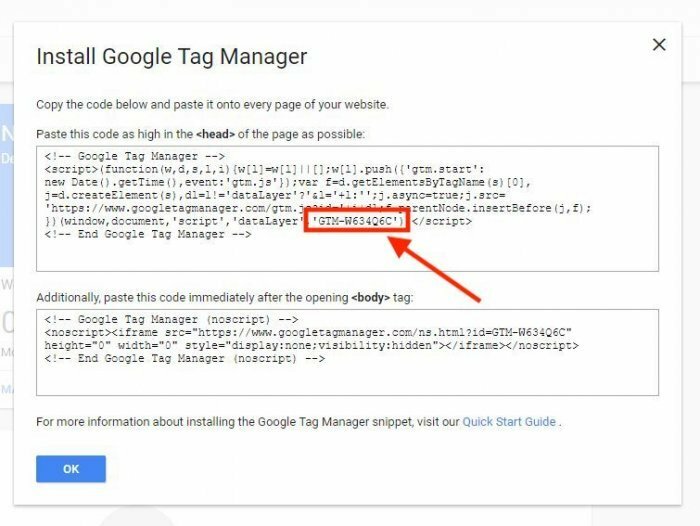 If you currently have a Google Tag Manager account set up, feel free to skip to the ‘Installing the Goole Tag Manager Code onto Your Wix Website’ section below. 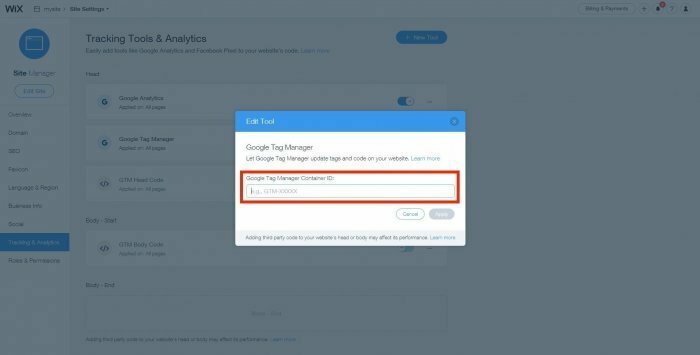 If you do not have a Google Tag Manager account set up, begin by following the steps below. Once logged in, you will be asked to Add a New Account. Click on the Web element in the Where to Use Container section. 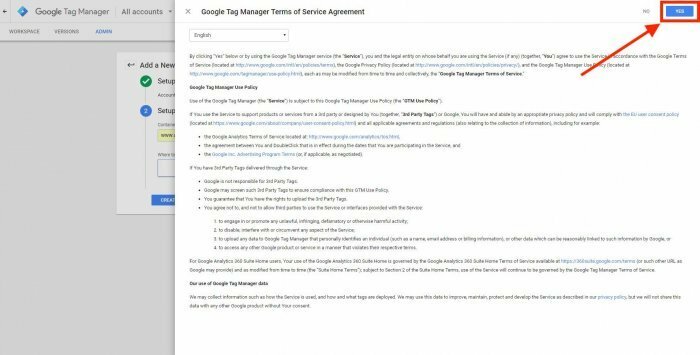 Next, you must agree to Google Tag Manager Term of Service Agreement. You will then receive an Install Google Tag Manager box on your screen. For other websites, you will need to add the whole code to your <head> and <body> elements; however for Wix we only require the GTM-XXXXXXX section. If you accidentally clicking off or closed the pop-up box, you can find the Container ID on the top-right of the screen. You can also find the Container ID and full Tracking Code by clicking on the Admin tab. 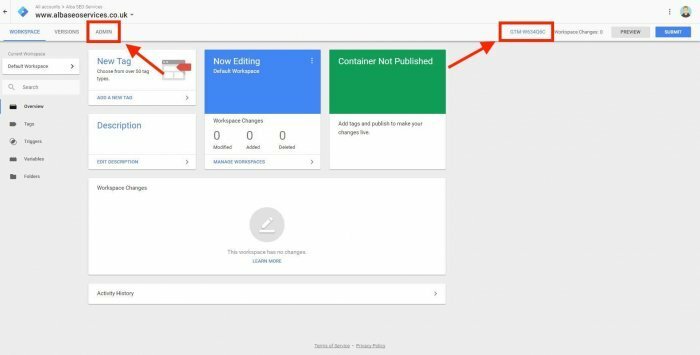 Navigate to the Install Google Tag Manager option under the Container column. You will then be able to find the full Tracking Code, along with your unique Container ID. Copy the unique GTM-XXXXXXX provided to you. 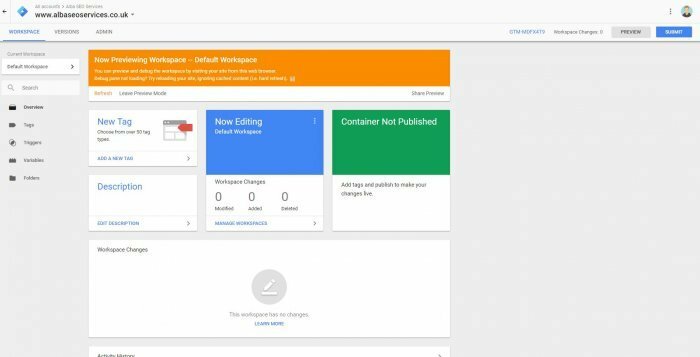 Now we have set up your Google Tag Manager account and obtained your unique container ID, it’s time to add it to your Wix website. Navigate to the Tracking & Analytics tab shown on the left-hand side panel. To add in your unique Google Tag Manager code that you copied, click +New Tool on the top right of the page. Click the Google Tag Manager option from the drop-down menu. 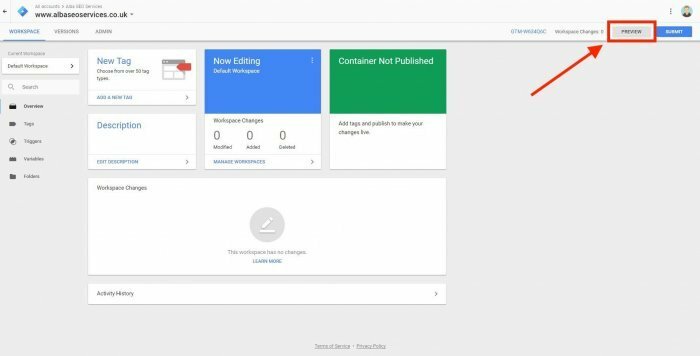 Insert Container ID (GTM-XXXXXXX) copied from Google Tag Manager. Click Apply once Container ID has been inserted. 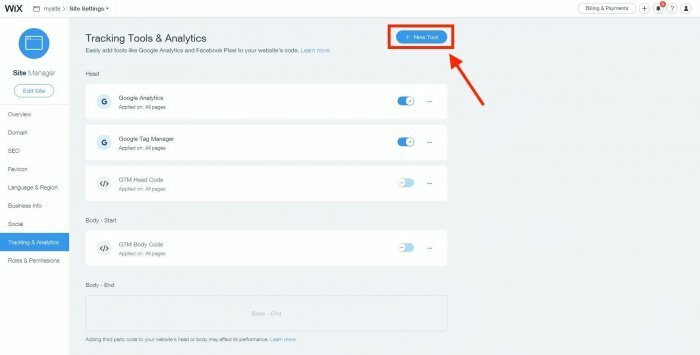 Switch back over to your Google Tag Manager Dashboard. 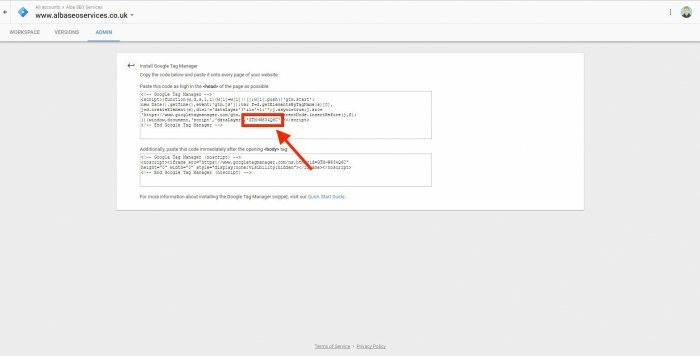 Click Preview on the top-right of your Google Tag Manager dashboard to test and debug your added code. Open a New Tab and head over to your website. Once there, a Debug Console Window should appear at the bottom of your browser. This window will displayed detailed information regarding your tags, their firing status and what data is being processed. If the Debug Console Window has appeared, your implementation of your Google Tag Manager to your Wix website was successful. 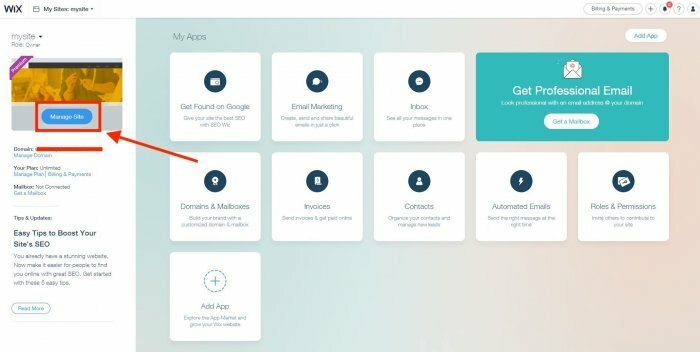 Now you have successfully installed Google Tag Manager onto your Wix website, you can begin to create tags to track what your users are interacting with, among many other things. 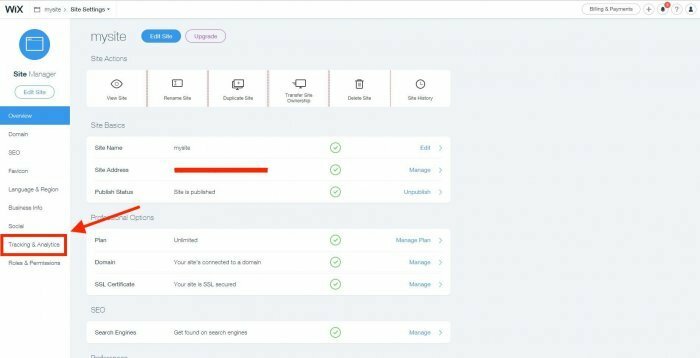 Google Tag Manager’s implementation offers flexibility to track conversions on your website, which as we know is a key component to success. If you find yourself struggling to insert Google Tag Manager to your website or if you require extra help tracking goals through Google Tag Manager, get in contact with us and we will be happy to help.